We’d love your help. Let us know what’s wrong with this preview of Jane and the Man of the Cloth by Stephanie Barron. Jane and her family are looking forward to a peaceful holiday in the seaside village of Lyme Regis. Yet on the outskirts of town an overturned carriage forces the shaken travelers to take refuge at a nearby manor house. And it is the For everyone who loves Jane Austen...the second tantalizing mystery in a new series that transforms the beloved author into a dazzling sleuth! To ask other readers questions about Jane and the Man of the Cloth, please sign up. Adoro questa serie mystery classici! La vita di Jane Austen ,presentata con dovizia di particolari,si incastra perfettamente con le vicende narrate tanto da far credere che la nostra cara Jane potesse davvero essere un'astuta investigatrice al servizio della Corona. Le descrizioni di abiti ed ornamenti nonché quelle di ambienti frequentati dai protagonisti e delle loro abitudini rispettano quello che era il 1800 inglese; inoltre le vicende narrate si incastrano perfettamente con quello che è il c Adoro questa serie mystery classici! La vita di Jane Austen ,presentata con dovizia di particolari,si incastra perfettamente con le vicende narrate tanto da far credere che la nostra cara Jane potesse davvero essere un'astuta investigatrice al servizio della Corona. Le descrizioni di abiti ed ornamenti nonché quelle di ambienti frequentati dai protagonisti e delle loro abitudini rispettano quello che era il 1800 inglese; inoltre le vicende narrate si incastrano perfettamente con quello che è il contesto storico in cui sono ambientate e ci sono continui e pertinenti riferimenti storici che rendono il racconto assai piacevole e credibile. La storia è intrigante,incalzante e per niente scontata. Non mancano colpi di scena e nulla è lasciato al caso: ogni dettaglio,indizio e informazione acquisita nel corso della lettura verrà alla fine spiegata e ci ricondurrà alla soluzione del caso. Non mancano nemmeno pettegolezzi,corteggiamenti più o meno velati e quel poco di romanticismo che basta per far arrossire una gentildonna di quell'epoca. Manners meet mayhem again in the second Being a Jane Austen Mystery, Jane and the Man of the Cloth. It is 1804 and Jane and her family are traveling by post chaise to Lyme Regis on the Dorset coast to escape the oppressive summer heat in Bath when their carriage is overturned and Jane’s sister Cassandra injured. Seeking help at a local estate, Jane and her family take refuge at High Down Grange and are thrown into the care of its mysterious owner Geoffrey Sidmouth and his beautiful young cousin Seraphine LeFevre. The manor house and its owner have enough of an oddness about them that our observant Jane thinks something amiss. With Cassandra on the mend they arrive at their rented cottage at Lyme and are shortly joined by Jane’s brother Henry and wife Eliza. After a walk on the Cobb Jane witnesses a heated exchange between Mr. Sidmouth and a local worker. The next day the man is found dead, bound hand and foot, swinging from a makeshift gibbet at the end of the Cobb. Intrigued, Jane seeks out the best source of information that a young lady of her gentility can garner: the mercantile shop and the weekly Assembly Dance. There the local gossip from Mrs. Barnewall, the Crawfords, Lucy Armstrong and the dashing naval officer Captain Percival Fielding inform Jane that Mr. Sidmouth is much more than the enigmatic romantic figure that she has suspected. Deep into the Napoleonic Wars, the Dorset coast is a hotbed of smuggling, spies and espionage whose ringleader, the notorious “Reverend,” or the “Man of the Cloth,” is known to favor fine silks in his nighttime free trade. Jane is conflicted over her feelings for Mr. Sidmouth and the fact that Captain Fielding claims he is the culprit. When Fielding is found murdered and Sidmouth arrested, Jane is asked by the local authorities to aid in the investigation setting her on the path of intrigue and danger. This is my second novel in the Being a Jane Austen Mystery series. It was another delight. Barron in known for interlacing known facts from Jane Austen’s life into her plots. This period of history for Jane is a bit of a mystery. There are very few letters remaining and only family lore alluding to her unfortunate love affair with a clergyman that she met on a seaside holiday who later died. 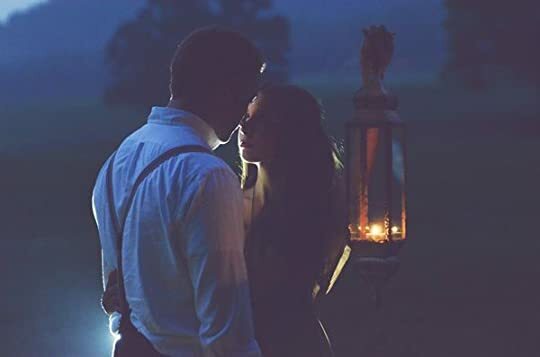 This “nameless and dateless” romance leaves lots of room for speculation and opens up the possibilities of a great mystery plot which Barron uses to her advantage. Our Jane is much more adventurous and daring in this narrative, sneaking out at night and investigating caves. We do get our share of Assembly Balls, frocks and finery, but the action was occasionally outside what gentile ladies are usually allowed to do, and at times I thought is a bit unbelievable – almost Jane Austen/Nancy Drew. The historical detail always brought me back into focus and I especially enjoyed the footnotes, though I understand they annoy some readers. I found myself laughing out loud, when I fear I should not, when Jane is introduced to High Down Grange with its dark, unkempt and unwomanly appearance and its present broody owner Mr. Sidmouth with his snarling dogs Fang and Beelzebub. Evoking memories of Bronte heroes, either my brain has been addled by too much historical romance reading, or Stephanie Barron has a wicked sense of humor! Jane and the Man of the Cloth by Stephanie Barron is a 1997 Crimeline publication. This second book in the Jane Austen mystery series charged from the gate, when an accident leaves Jane’s sister Cassandra badly injured. But, the momentum was quickly doused with too much wordy dialogue that filled pages, but left me wondering when Jane was ever going to start working on the mystery. Eventually, the pieces began to fall into place, but it took so long I seriously considered returning it to the libr Jane and the Man of the Cloth by Stephanie Barron is a 1997 Crimeline publication. But, the momentum was quickly doused with too much wordy dialogue that filled pages, but left me wondering when Jane was ever going to start working on the mystery. Eventually, the pieces began to fall into place, but it took so long I seriously considered returning it to the library unfinished. Smuggling was a huge issue during this time period, so it was not at all far-fetched that Jane noticed what appeared to be just that sort of business running through Lyme Regis, which is where she is staying for the moment. So, intrigue abounds and soon Jane finds herself attempting to lure out a smuggling operation two murders. Will she be able to figure it out without putting herself and her reputation on the line? The setup is certainly interesting, but it seems like the mystery was danced around amid all the social verbiage. However, the pace picks up drastically in the last quarter of the book and became very engaging with a very surprising ending. I still intend to continue on with the series because I have a print copy of the next installment. Hopefully, the pacing will improve by then. This is one intrepid Jane Austen! It is September 1804, Jane, her sister, Cassandra, Mr. and Mrs. Austen are on their way to Lyme Regis for a seaside holiday when their carriage is overturned in a storm just outside of the seaside village. Cassandra is injured and Jane heads off with the postboy to the manor house they see lighted in the distance. This is where she meets the rather rude and glowering Mr. Geoffrey Sidmouth and gives him a most scathing setdown as she seeks his help! Only Jane cou This is one intrepid Jane Austen! It is September 1804, Jane, her sister, Cassandra, Mr. and Mrs. Austen are on their way to Lyme Regis for a seaside holiday when their carriage is overturned in a storm just outside of the seaside village. Cassandra is injured and Jane heads off with the postboy to the manor house they see lighted in the distance. This is where she meets the rather rude and glowering Mr. Geoffrey Sidmouth and gives him a most scathing setdown as she seeks his help! Only Jane could stand her ground against such a man! This is definitely not a good beginning to a relaxing seaside holiday! As Lyme Regis is on the coast of Dorset, it is well known for smugglers. Jane soon finds her attention taken away from the manuscript she is trying to write (The Watson's) and is drawn into the intrigues of the local society and the bad blood between Mr. Geoffrey Sidmouth and the smooth talking Captain Fielding. It has been two years since Jane she proved her dear friend, Isobel, the Countess of Scargrave, innocent in the death of her husband. Now she is trying to determine who is the leader of the smugglers, known as The Reverend, and why she has such conflicting emotions over Geoffrey Sidmouth! To further plunge her into this investigation is the murder of one man by hanging and then the murder of another. "And thus we have the caricature of our age - a gentleman of weak understanding, who apes the form of gentility in an effort to supply his want of substance." I highly recommend this series and that you read them in order. I was pleasantly surprised to read of a character from the first book in this one! This one earned a 4.5 from me for several reasons. in Sept 1804, just 4 months before his passing in Jan. 1805.
the Mrs Bennet of P&P '05, rather than P&P '95. Some two years have passed since Jane Austen had cause to exercise her fledgling detective skills on behalf of a friend - namely, Isobel, Countess of Scargrave, who, being charged with murder, found herself exonerated thanks to her friend's tireless efforts to uncover the truth of the sad circumstances surrounding her husband's death. Now Jane is bound for the coastal town of Lyme, in the company of her parents and beloved sister Cassandra, when en route their coach is overturned in a violent st Some two years have passed since Jane Austen had cause to exercise her fledgling detective skills on behalf of a friend - namely, Isobel, Countess of Scargrave, who, being charged with murder, found herself exonerated thanks to her friend's tireless efforts to uncover the truth of the sad circumstances surrounding her husband's death. Now Jane is bound for the coastal town of Lyme, in the company of her parents and beloved sister Cassandra, when en route their coach is overturned in a violent storm and Cassandra is left injured. The ever-resourceful Jane seeks help and refuge from the closest home available - High Down Grange, where she meets its owner, the brooding Geoffrey Sidmouth and his beautiful French cousin, Seraphine LaFevre. The manner of their introduction leaves Jane convinced that all is not as it seems at the Grange. After the Austens are safely installed at their rented cottage, the mystery of Geoffrey Sidmouth takes a sinister turn when the object of the man's scorn is found hung at the water's edge. Her curiosity roused, Jane begins to make discreet inquiries and discovers it is openly assumed that Sidmouth is "the Reverend" or "the Man of the Cloth," one of the Gentlemen of the Night - smugglers - who haunt the English coast specializing in the illicit "import" of fine silks and other highly-taxed goods. When one Captain Fielding, a retired Naval officer who claims to be investigating the Reverend, is discovered murdered and all evidence points to Sidmouth's guilt, Jane must use all of her intelligence and investigative abilities to discover the truth of Sidmouth's activities on the coast - for she is as loathe to believe his guilt as she is to admit that the master of the Grange may have captured her heart. Stephanie Barron's second offering featuring the beloved Jane Austen as amateur sleuth is every bit as delightful as the first, proving Barron to be a master at channeling Austen's style and incisive wit and fleshing out what little is known of her life with historical fact and rich period detail. It is established fact that Jane visited Lyme during 1804, and indeed what she encounted there must have made a powerful impression since the town is featured in her final novel, Persuasion. Little correspondence survives from this period in Austen's life, and family rumor alone alludes to a "nameless and dateless" romance Jane experienced with a clergyman during a seaside holiday that provide tantalizing, but unformed, glimpses into this period of Jane's life. Barron uses these bare facts as the basis for Man of the Cloth, fleshing out this period in Austen's life, resulting in a rousing tale of mystery, adventure, espionage, and ill-fated romance. Jane's adventures are wildly varied - she gains as much intelligence from assembly room dances and sitting room calls as she does from highly unorthodox investigations of smugglers' caves and hidden tunnels. One could argue that so much outdoors adventure is outside the realm of possibility in the life of an author known for incisive social commentary, but I for one find the high adventure aspect of this fictional sojourn in Jane's life a fitting tribute of sorts to the adventurous, sensational gothic novels popular in Austen's day, that she would later satirize in her own Northanger Abbey. This is my second time reading this and I'm increasing my rating to 5 stars!!! I didn't remember how the book went, and now I can't believe I forgot such an exciting adventure (view spoiler)[and a lovely romance! I did, however, remember Lord Harold showing up at the last! :D (hide spoiler)]. It is definitely my favorite of the Jane Austen Mysteries and since it is my favorite book series, that's saying a lot! It's probably also because of the Darcy vs Wickham + Georgiana vibes! This time around This is my second time reading this and I'm increasing my rating to 5 stars!!! 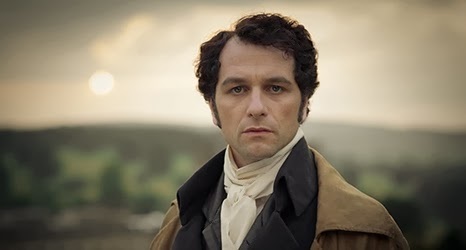 http://1.bp.blogspot.com/-_hi3rNXGHg8... <--Matthew Rhys as Darcy in Death Comes to Pemberley. He's kind of a Darcy in this book too, right, so why not? In the future, please show, not tell. Very enjoyable! Also, sadly, very forgettable. It's well-written and the plot is engaging but there isn't enough sense of place and the characters aren't the most memorable either, which is a shame for a series focused on my favourite writer. I'll continue reading those but I won't binge reading the whole series anytime soon. Another good mystery that continued to help me learn more of Regency England manners and methods. Has a "Bad Man" character who Jane is interested in and a "Good Man" character. Loved the setting in Lyme. I think this one was better than number 1! I read this in paperback when it first came out but need to reread it in order to post a clear review. The Being A Jane Austen Mystery Series by Stephanie Barron is a brilliant series of novels that features our beloved Jane Austen being thrust into the midst of mystery, murder and mayhem. In each novel Jane Austen uses her astute observational skills, keen understanding of human nature, and fierce determination to solve various mysteries. Each novel follows the time line of Jane Austen's career and accurately portrays true events and people from her life. This second book takes place in the year The Being A Jane Austen Mystery Series by Stephanie Barron is a brilliant series of novels that features our beloved Jane Austen being thrust into the midst of mystery, murder and mayhem. In each novel Jane Austen uses her astute observational skills, keen understanding of human nature, and fierce determination to solve various mysteries. Each novel follows the time line of Jane Austen's career and accurately portrays true events and people from her life. This second book takes place in the year 1804 (two years after Jane Austen's last adventure in Scargrave). In this novel Mr. and Mrs. Austen travel to Lyme Regis with their two daughters on an extended holiday. Instead of strolling along The Cobb, frequenting the shops on Broad Street, and writing a few chapters in her new manuscript, our beloved author/Regency sleuth becomes embroiled in another mystery and spends her holiday traipsing about caves, visiting prisoners in the Lyme gaol, and gathering clues about a mysterious band of smugglers! Having read several novels from Stephanie Barron's excellent Being a Jane Austen Mystery Series there are three elements that I have found to be synonymous in all her novels. One is her exemplary emulation of Jane Austen's voice. Stephanie Barron's voice for Jane Austen is the perfect blend of intelligence, impertinence, and sarcasm. I know we have no way of knowing how accurate Stephanie Barron is in her portrayal, but my guess is she is pretty darn close! The second book in Stephanie Barron's series, Jane and the Man of the Cloth, both disappointed and surprised me. I found it to be a little long-winded when it came to some of the descriptions of scenes (especially in and among the caves) and I thought there were a few too many players on the scene. Nevertheless, I found more that I liked and enjoyed about the book that far outweighed my own personal dislikes. +Mr. Sidmouth. What a great character! Mysterious and misjudged. Reminded me ve The second book in Stephanie Barron's series, Jane and the Man of the Cloth, both disappointed and surprised me. I found it to be a little long-winded when it came to some of the descriptions of scenes (especially in and among the caves) and I thought there were a few too many players on the scene. Nevertheless, I found more that I liked and enjoyed about the book that far outweighed my own personal dislikes. +Mr. Sidmouth. What a great character! Mysterious and misjudged. Reminded me very much of Mr. Darcy. +Once again, I love that Barron sets the book in Lyme at a time when the true historical person would have been there. 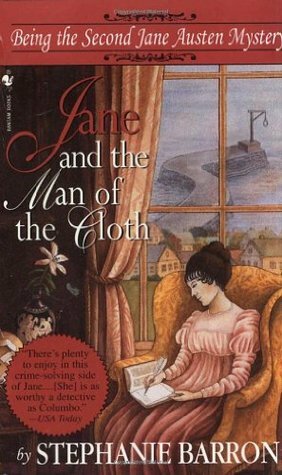 I also enjoyed reading Man of the Cloth at the time I did - after my very first reading of Persuasion! It felt like a familiar setting and place. I loved the writing, but the mystery was just too easy to solve and not enough romance for me. I love the Austen-like dialogue and attention to detail. The only thing I didn't like was the footnotes, but I only referred to them if I didn't understand the references in the text. I liked it! Having read nearly all of Jane Austen's works, and several of them many times, at first I was put off by seeing lines in this novel that nearly or exactly echoed lines from the actual writer's works ... but at some point it occurred to me that this novel is meant to be pages from Jane's diary, and thus it's entirely reasonable that she'd have tried out phrases in here, that she would later use in one of her novels. Once I got past that stumbling point, I was more than happy to suspen I liked it! Having read nearly all of Jane Austen's works, and several of them many times, at first I was put off by seeing lines in this novel that nearly or exactly echoed lines from the actual writer's works ... but at some point it occurred to me that this novel is meant to be pages from Jane's diary, and thus it's entirely reasonable that she'd have tried out phrases in here, that she would later use in one of her novels. Once I got past that stumbling point, I was more than happy to suspend my disbelief regarding Jane taking actions in the furtherance of detecting. I liked the imagining of her relationship with her father: I've never done any scholarship into what her personal life was really like, but I am happy thinking of her having had a loving and tolerant relationship with him. I've read a couple other entries in the Jane Austen "fan fiction" genre, but frankly very few as I'm loath to pollute the Austen-world in my head with work that isn't hers. * But I liked this, maybe precisely for the reason I was initially put off; the language used was very much on point. Also I thought the action was quite rollicking (probably suspiciously for the time, but it pulled me along as the reader). In general I'd say try it out. I'll most likely go back and read the Jane Austen Mystery #1 some time soon. Seconda indagine di Jane Austen. Mentre la famiglia Austen sta andando per un soggiorno estivo a Lyme Regis, la carrozza che li sta trasportando si ribalta e Cassandra la sorella di Jane rimane gravemente ferita. Jane si reca alla casa più vicina per chiedere aiuto e si imbatte in Geoffrey Sidmouth, un uomo molto affascinante, ma che la inquieta molto. Dopo poco che la famiglia soggiorna a Lyme un uomo viene trovato impiccato sulla spiaggia e la colpa ricade sul Reverendo. Il signor Sidmouth viene Seconda indagine di Jane Austen. Il signor Sidmouth viene accusato di omicidio quindi Jane investiga per salvare la sua reputazione. Lui ormai gli è entrato nel cuore. Come il precedente mi è piaciuto moltissimo. Lo stile di scrittura, la descrizione di luoghi usi è vestiti sono giusti per epoca narrata e sembra di essere al fianco di Jane. This entire series is FAB! The ultimate reading for mystery readers who also adore Jane Austen and history. Barron entwines Jane in mysteries set in the exact location where Jane was at that time. Each mystery 'could' have occurred. The research into Jane's personal life, rules and habits of the time, real locations at that time, etc, make these books so realistic, and so enjoyable. Jane comes to life and showcases her superb mental faculties in these books. Read them ALL--and in order!!! I'm re- This entire series is FAB! The ultimate reading for mystery readers who also adore Jane Austen and history. Barron entwines Jane in mysteries set in the exact location where Jane was at that time. Each mystery 'could' have occurred. The research into Jane's personal life, rules and habits of the time, real locations at that time, etc, make these books so realistic, and so enjoyable. Jane comes to life and showcases her superb mental faculties in these books. Il secondo capitolo della storia mi è davvero piaciuto. Il personaggio di Jane Austen, forse grazie all’ambientazione che tanto ricorda Persuasione e alle connessioni fra romanzo e vita reale, non sembra più così nebuloso come appariva nel primo libro. Continua il gioco del "chi è chi", nonostante ci siano soggetti nuovi ed originali, si finisce sempr Il secondo capitolo della storia mi è davvero piaciuto. Il personaggio di Jane Austen, forse grazie all’ambientazione che tanto ricorda Persuasione e alle connessioni fra romanzo e vita reale, non sembra più così nebuloso come appariva nel primo libro. Continua il gioco del "chi è chi", nonostante ci siano soggetti nuovi ed originali, si finisce sempre con il volere rintracciare gli autentici personaggi di Jane Austen. C’è anche spazio anche per una contaminazione di tipo “Bronteana”, mentre la parte relativa all’incendio e alla fuga di Sidmouth dal carcere sono degne della signora Radcliffe, largamente menzionata anche dalla stessa Jane. Following the events at Scargrave Manor, Jane accompanies her mother and father and beloved sister Cassandra to Lyme in Dorset. Even before they arrive at their hired cottage in the town, events conspire to bring Jane into contact with the mysterious Mr. Sidmouth, a man who clearly has secrets, and his cousin Seraphine LeFevre. At her first assembly in town, Jane also meets Captain Fielding, who has no good words for her about Mr. Sidmouth, whom he declares to be one of the most notorious rogues Following the events at Scargrave Manor, Jane accompanies her mother and father and beloved sister Cassandra to Lyme in Dorset. Even before they arrive at their hired cottage in the town, events conspire to bring Jane into contact with the mysterious Mr. Sidmouth, a man who clearly has secrets, and his cousin Seraphine LeFevre. At her first assembly in town, Jane also meets Captain Fielding, who has no good words for her about Mr. Sidmouth, whom he declares to be one of the most notorious rogues in a town known for its "Free Traders" (i.e., smugglers), a man known only as the Reverend. Indeed, the captain is certain that Sidmouth is this leader of Free Traders, and insists that he will do his utmost to bring him in, in his capacity as assistant to the Customs officers. Once again, I enjoyed the world around Austen and felt as immersed as ever in the time period. However, the story in this book really dragged on for me. It started quick enough, with a dangerous accident on the road followed by the presence of a mysterious rogue to aid them. But nothing seemed to happen for the next 2/3rds of the book, aside from stolen glances and hinted at attractions - until at last, a true crime was committed. But by then, I just wanted to get the book over with. I will say t Once again, I enjoyed the world around Austen and felt as immersed as ever in the time period. However, the story in this book really dragged on for me. It started quick enough, with a dangerous accident on the road followed by the presence of a mysterious rogue to aid them. But nothing seemed to happen for the next 2/3rds of the book, aside from stolen glances and hinted at attractions - until at last, a true crime was committed. But by then, I just wanted to get the book over with. I liked this much better than the first novel. It's an enjoyable read and the mystery this time is better developed and more interesting. I'm still not convinced that Jane Austen and Agatha Christie should be mixed and I'm also not convinced that some of the things that are mentioned are what would have been permissable in society at that time. But historical fiction is usually not historically correct and it's done well enough that it is not glaringly obvious. I might read this again some time. This review has been hidden because it contains spoilers. To view it, click here. I lost interest in the middle for a day or two. The book was dragging for me. I read this one close on the heels of #1 and I think I will take a break before reading the next in the series. As soon as Captain Fielding spoke about Mr. Sidmouth I could see the parallels to Darcy and Wickham. I would like ot get to a book in the timeline where some of Jane's novels are published so there may be less quotes from her work. While I think I may have had this book for some time, the paperback copy I have is quite discolored and the cover is crumbling, I have enjoyed reading this historical mystery quite a bit. While I had figured out the actual culprit a bit before Jane, I enjoyed seeing all the pieces come together. It is a delightful mystery read and if you like Jane Austen, the writing honors her greatly. I enjoyed having the editor’s note in the text and not at the end. I love all of the historical detail in these mysteries, including the footnotes. I love that Jane is intelligent and perceptive. And I love that Jane faces her emotions and relationships in her situation in life. Makes me want to write in my own journal, though I could never write as much as Jane! Any Nancy Drew fans out there? Did Jane's exploits in the cave remind you of the mystery of the tolling bell? IMHO, the first half of this book was BORING, so much musing and pondering, blah. Then the second half sprinted to the finish full of action and adventure. Oh, and how the author loves the word, singularly. Part 1, Ick. Part 2, fun. Stephanie Barron was born Francine Stephanie Barron in Binghamton, NY in 1963, the last of six girls. Her father was a retired general in the Air Force, her mother a beautiful woman who loved to dance. The family spent their summers on Cape Cod, where two of the Barron girls Librarian Note: There is more than one author in the GoodReads database with this name. See this thread for more information.